This could easily be considered a definitive Roman Empire documentary that collects all four episodes of the television series into one collection. Focusing on the Golden Age of the Roman Empire which some historians and scholars believe was the first century, this also saw many defining moments for this culture. Episode 1 – Order from Chaos focuses on one of the greatest emperors of the Roman Empire, Augustus who was adopted by Julius Caesar and after the murder of his great-uncle Julius Caesar, he became a force to be reckoned with. After defeating the Egyptians, Augustus came home a hero and even though he was a fair man in terms of politics and his people, he had a brutal side as well. Ruling for over 40 years, Augustus created the true foundation of Imperial Rome. Following Order from Chaos comes Episode 2 – Years of Trial and after the death of August in 14 A.D., his successor Tiberius attempted to restore peace to not only the empire but the senate as well. After politically defeating his rival Sejanus, the Emperor Caligula came into the picture. Although starting as a modest and fair emperor, he became quite insane who ordered the death of many and eventually finding death at the hands he had caused unjust. Following Caligula as emperor came Claudius who worked extremely hard for liberty within Rome such as increasing the privileges of woman and even giving slaves rights. Quite a forefather in his politics, his personal life would damage him as he finally ordered the death of his promiscuous wife. During this episode, the outskirts of the Roman Empire are now beginning to crack with unrest in Egypt against the Jews and emergence of Jesus Christ. Episode III – Winds of Change begins with Claudia remarrying and more concerning was that this was his niece Agrippina. Quite a political player, Agrippina removed her political rivals and even asserted her authority to make her son Nero, the legitimate heir of the Roman Empire. Eventually Agrippina poisoned her husband Claudia in order to promote her son Nero to power. Unfortunately as fate would dictate, Nero would eventually kill his mother to the shock of the Roman public. In Britain, unrest has been caused by Boudicca, a rebel queen and Judea is also feeling the unrest. Although Nero assisted the public with new buildings and the like, stories were heard that Nero danced and sung when Rome was burning. Eventually Nero starts the persecution of the Christians in order to move the attention from him which almost causes Rome to fall into another dark age. Eventually the senate steps in and before being able to execute Nero, he accepts, only to perform the deed himself. Civil War is now a great risk to the Roman Empire. Lastly, we have Episode IV – Years of Eruption that has generals and senate leaders bickering and warring amongst themselves as to who will become the new emperor of Rome. One general does succeed, Vespasian who conquered the rebels in Judea and marched his army towards Rome to eventually become emperor, however after one last attempt to squash the insurgence in Judea that made him a hero. Eventually Vespasian turns his attention back to his people by creating new buildings such as the Coliseum. Eventually Vespasian dies in 79 A.D. and the legendary city of Pompeii is destroyed, once again Rome is left without a ruler but not for too long. Eventually Trajan will be “crowned” as Emperor who once again attempts to return Rome to a Golden Age and is almost successfully. With four truly engaging and amazing documentaries, Empires – The Roman Empire in the First Century is great for history and non-history buffs alike as it is not too complex and quite down to earth at times. The facts are told in a way that keeps the viewer interested that is perfectly matched by the actual places where these events occurred and the re-enactments. 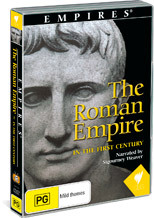 Another brilliant DVD from the Empires series!